Handcrafted custom cedar hope chest made for Jennifer Anderson. 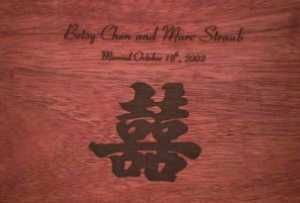 She chose Bubinga and Aromatic Cedar from our list of woods for this special Heirloom cedar chest as a wedding gift. It is in Walker style with a solid wood lid, and dovetailed original base. 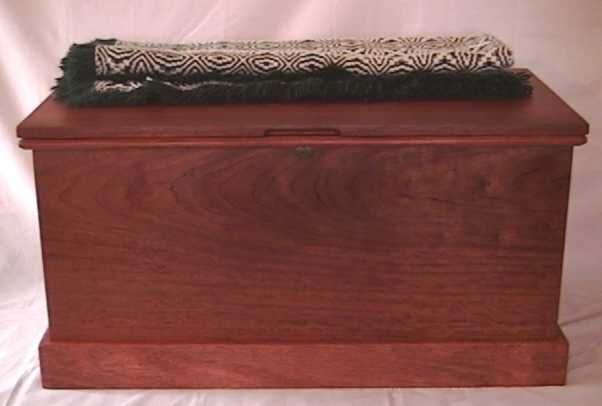 This chest is our Blanket size and measures 36 inches wide 19 inches deep and 19 inches high. She also chose to add a lock and a very personal laser engraving inside the lid. Jennifer's choice of Bubinga, often referred to as African rosewood, is a very solid one. Bubinga is very hard and sometimes comes in very wide boards. If you think the grain in the front is well matched it is because it is made from one piece of wood an extremely rare occurrence in today's furniture. 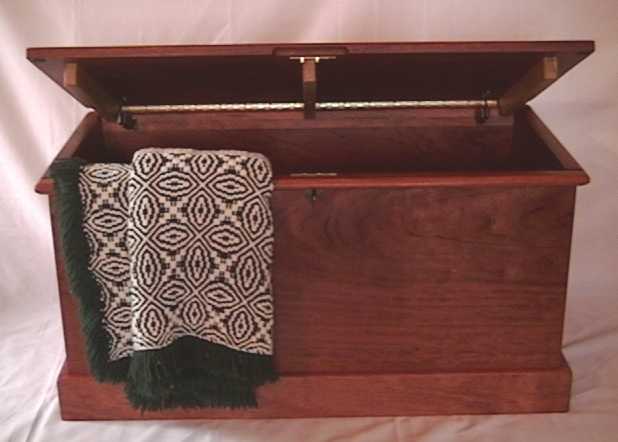 With so many options to choose from, it's easy to make your cedar chest a special one. To keep the clean look of this piece, Jennifer chose our standard wooden top and to keep it from warping, we used three strong ash support rails with sliding dovetail joints to allow the wood to move as humidity changes over the seasons, yet remain flat. To assist in lifting this heavy chest, a solid trim rail has been glued, then secured with plugged screws onto the box. 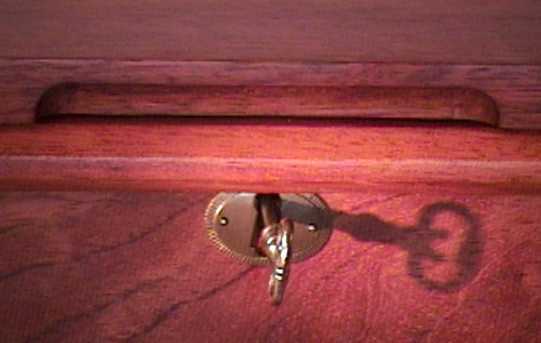 To keep things together Jennifer, chose the half blind dovetail joint that you see in fine furniture that has stood the test of time. 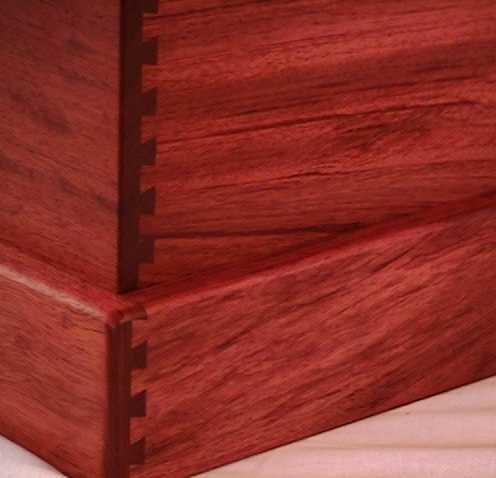 A half blind dovetail joint does not show on one face so as not to break the line in the design and look of the front of the chest yet adds the mechanical strength necessary for this piece. Laser engraving and English locks are only two of the many options available in making your treasured keepsake. Jennifer sent us this design via E mail in a file she created. The lid of this chest is also the rare one solid board. The close up picture on the right gives a hint of the ripple in the grain that occasionally shows up in this richly beautiful wood. Our cedar chests come with or without feet. The choice is yours, when you order your own custom made cedar chest. From the choice of wood, to the size and style of the chest, to options of lids, engraving, locks, Lifts, and feet, we'd love to craft one for you and your loved ones. Please visit our web pages or call us to see what you can choose for your own handcrafted, custom cedar chest.